I knew this day would come. I approached slowly, glancing at the press of people crowding the area, and I though about what had led me to this. Maybe it was all those baguettes, with mouthwatering meats and cheeses in France. Or was it my goal to taste a local beer in every country from Croatia to Cambodia? Whatever the cause, as I neared the first bin, or ‘trash can’, now that I’m in the US, and lifted the lid gingerly with one finger, it was those tastes I held in my mind. I had chosen a good spot for my first ‘dumpster diving’ attempt, at a pop-up food truck event close to the iconic Golden Gate Bridge. These decorated trucks formed a horseshoe around a three piece jazz band, whose easy tunes served the dual purpose of pleasing the hungry crowd, and diverting their attention from me, just a few meters away, as I peered into what I hoped would hold the evenings meal. I’m in San Francisco as part of a budget around-the-world cycling trip. Five dollars a day sounded perfectly reasonable from my armchair at home in London, but in addition to baguette and beers; flights, shipping costs for Dora, my bicycle, and a thousand other small expenditures had dried up my pool of finances faster than a naïve boy in his armchair could have predicted. Although even if five dollars had been available, the delights served by these trucks would have remained out of reach. Sizzling steak subs, artisan donuts the size of burgers and fancy burgers the size of walnuts were on offer, and it was their greasy wrappers and containers that greeted my searching eyes. It was easy to tell if the paper wrappers contained anything of value, but the cardboard containers had to be checked individually. First, their weight was assessed. Most were light, empty, but before long I held a box with more promise than the others. Then, not wanting to make my intentions too obvious, I straightened up and casually took a seat in front of the band. My fingers shook a little as I opened the box, there was a thrill I hadn’t expected, but it may have been due to my outfit choice in the chilly night air. Inside I found two, half eaten pieces of bread. It was a poor find, but the smile on my face was genuine. I had done it! I had found food that I didn’t need to pay for. At that moment I knew I wouldn’t be going hungry. My next few attempts were more successful, then I began to get lucky. A full steak sub, a plate of hot BBQ ribs and even one of the walnut sized burgers were rooted out from the rubbish. I ate until I could eat no more, and then I left, hoping I hadn’t been noticed. But who would notice someone with a fully loaded bicycle, wearing Lycra, rooting through the trash cans of San Francisco? So that’s what I’ve been up to as I cycled along the stunning west coast of California, where I found people so welcoming, friendly, helpful and generous that I can scarcely put it into words. I have been given help and support, food, and places to stay with a warm shower and a hot dinner all along my route, from the day I arrived in San Francisco to this moment. At the same time, after making a page on GoFundMe, I have received a torrent of financial help and support from my family and friends at home and abroad. I am thankful to each and everyone who has helped me out and prevented a problem that could have seen me forced to fly home early, forfeiting my chance to finish this amazing journey. Thank you all so much. I won’t forget. If you would like to help me out and buy me a meal then please go to http://tw.gofund.me/nsuybo where you can donate. 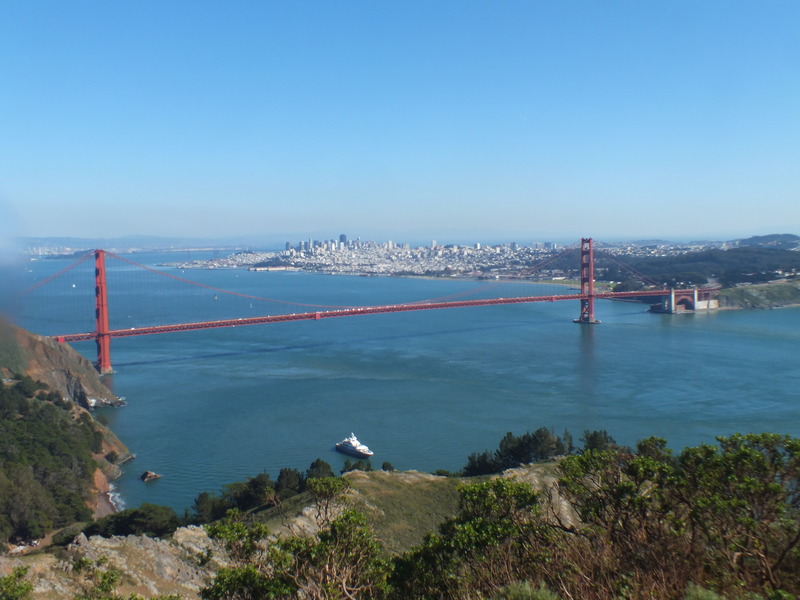 « San Francisco has only one drawback – ’tis hard to leave.